Greetings from the Gouds in PNG! 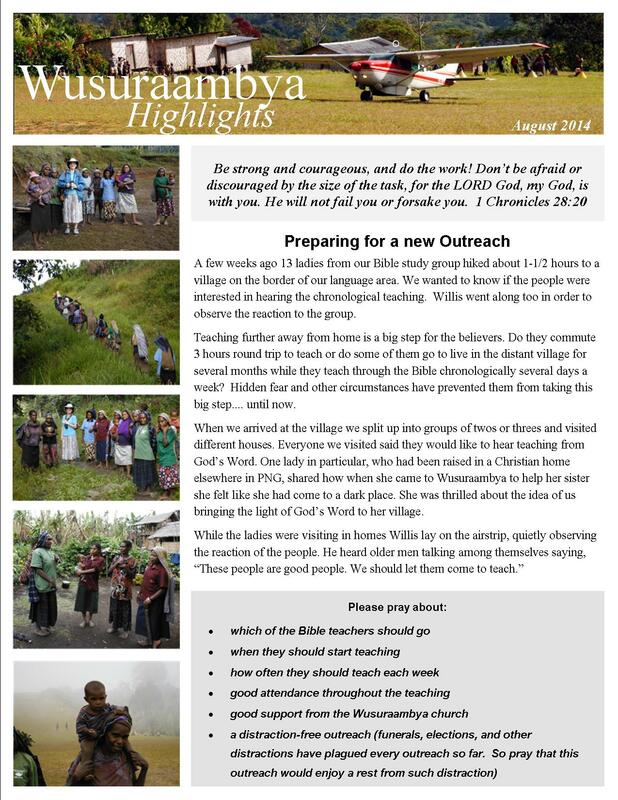 August has been an eventful month for us and for the Wusuraambya Bible Church. Seventeen church members walked the two-day hike to a neighbouring tribe where they attended an annual believers’ conference. The conference began on a Friday and finished on the Sunday. 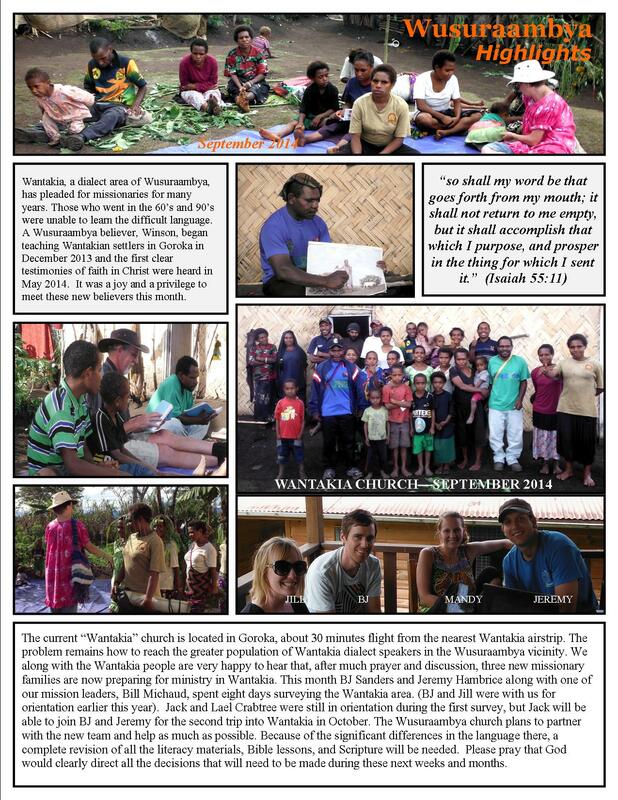 Three NTM missionaries from the Wantakia tribe (near us) were the main conference speakers and did a terrific job. Also one Aziana believer taught the last session on Sunday. After returning to Wusuraambya, men who had attended the conference each represented one of the conference speakers and taught the local believers everything they heard during the conference. In this way the whole church was encouraged. In the picture above we are posed with those who are wanting to accompany us on a walk for ALS in September. Our brother-in-law Dave Godin is a victim of ALS for which there is currently no cure. 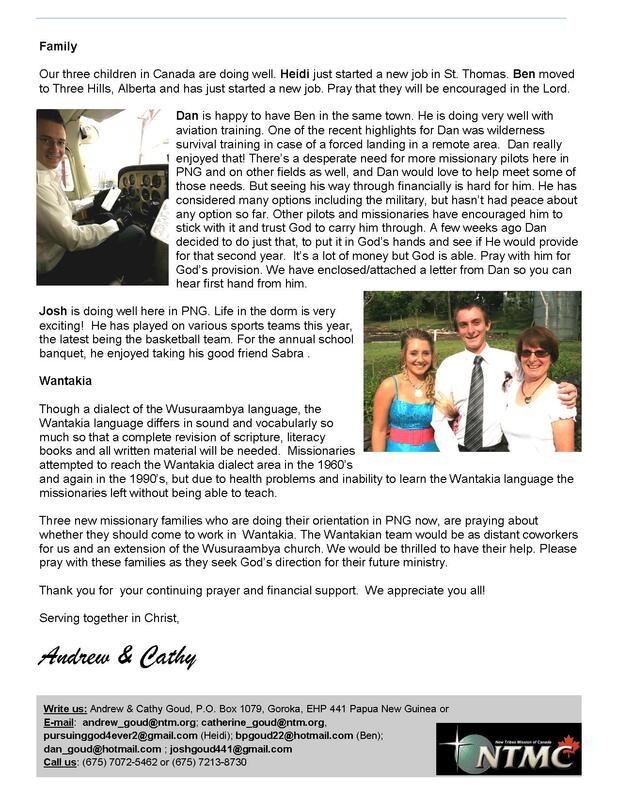 The “Godin Gang” will be representing Dave this year in a walk to raise support for ALS research and since we are so far away we asked the local church if they would like to walk with us here in PNG on September 24th when others will be walking in London. They were very excited to do this and be a part in this way. You can click on the picture above or go to this link: http://www.alsevents.ca/PNGteam to find out more details. Our niece, Kira Fondse, has been here most of this month helping out in a lot of ways such as cooking, baking, cutting and trimming flash cards for the new literacy program, formatting literacy books, helping with Sunday School, and during the last week in the tribe, teaching music to 70 students in the local government school. She did a wonderful job! The Wusuraambya people love Kira because she can pronounce their language and even likes the food they eat! We are really looking forward to teaching literacy again with the new books but first we have to re-write the teacher’s manual for the new course. There’s lots more to talk about but we’ll keep it “short” for now as we know you are all busy and nobody has time for long emails! 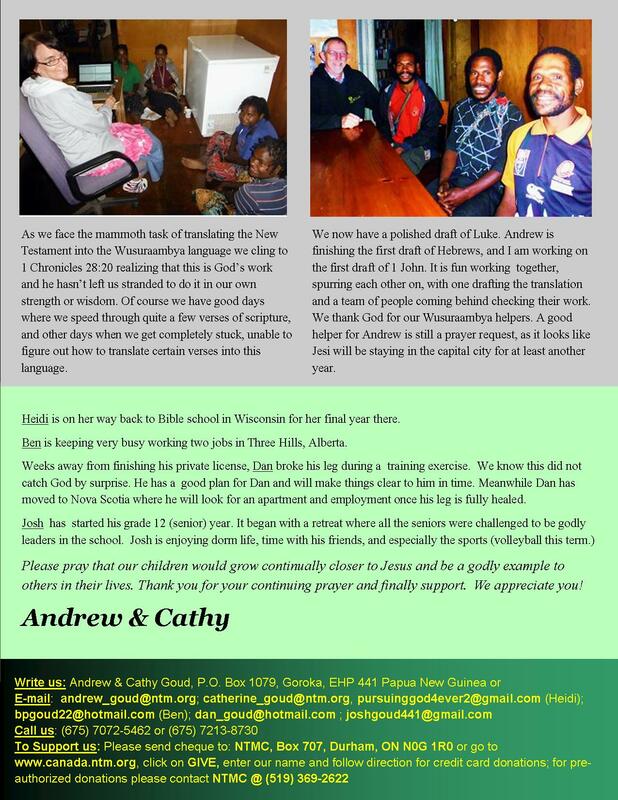 We would appreciate your prayer for suitable people to help with Bible translation and also the checking of the last literacy primers. 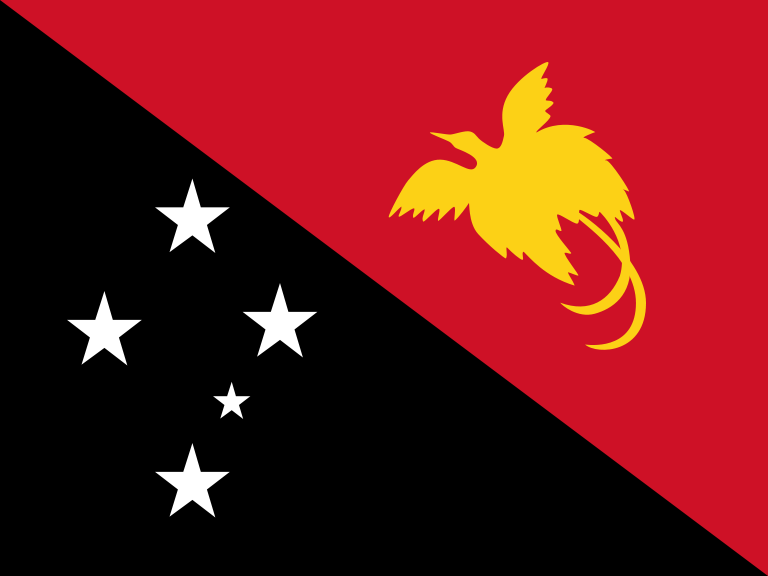 We hear that Jesi is on his way back from Port Moresby. Pray that he can settle peacefully back into his village and church in Wusuraambya. 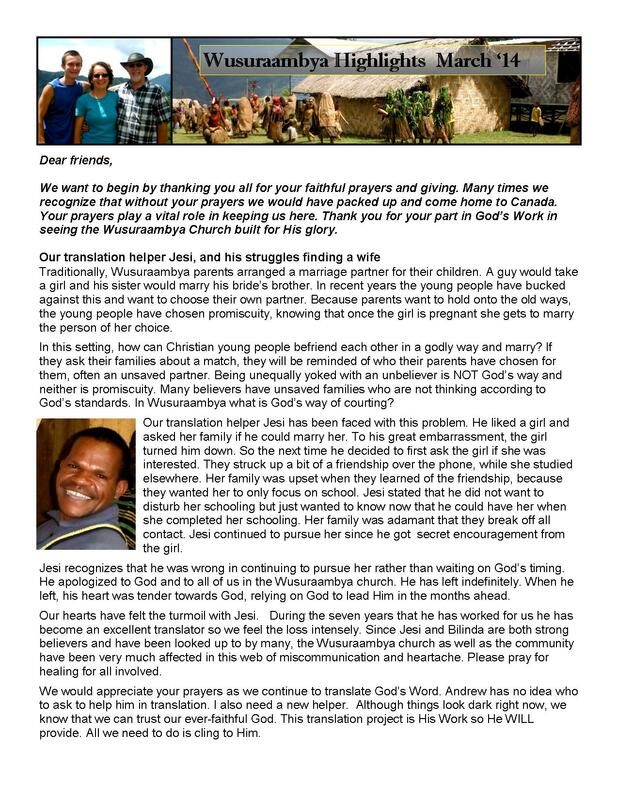 Thanks for your continued prayer and financial support. Thank you once again for your faithful prayer and financial support in 2014. Just before the end of the year we received news that Dad Goud had collapsed with cardiac arrest and was in ICU. Cathy had been Skyping with Mom Goud over the weekend and knew Dad was having trouble breathing. When we heard that he was in ICU Monday morning, and not knowing whether he would survive, we felt that it was important for me to fly home immediately. Normally between Christmas and New Year’s we see very few planes in the Wusuraambya valley. But when I called MAF (Missionary Aviation Fellowship) Monday morning, they told me that a plane was coming into the area shortly. The only question would be whether there would be space for me. As it was however, some of the passengers didn’t show up so within 1-1/2 hours of making the decision for me to go, I was on the way to Goroka. That afternoon I went on the internet with my cousin Sylvia Krobel who is a missionary at our field HQ, and together we were able to find tickets at a reasonable cost, leaving the next morning. I would have arrived in London, Ontario New Year’s Eve had the plane not had mechanical problems in Los Angeles. As it was I was delayed by a day and arrived in London New Years day afternoon. Dad is still in ICU after nearly two weeks and expected to be in hospital for at least two more months. He is communicating much better than the first days. His breathing tube is being removed right now. Please pray that he would be able to breath without the help of machines now. What I didn’t expect was to be able to see Heidi, Ben and Dan while here in Canada this visit. When Ben and Dan heard about their grandfather collapsing, and about me coming, they both hopped on planes and came to join me here for 9 days. That was a very nice surprise. Heidi was already here when I arrived, with plans to return to school a few days later. So we had several days altogether before Heidi flew out. In the meantime Cathy and Josh are still in Wusuraambya. 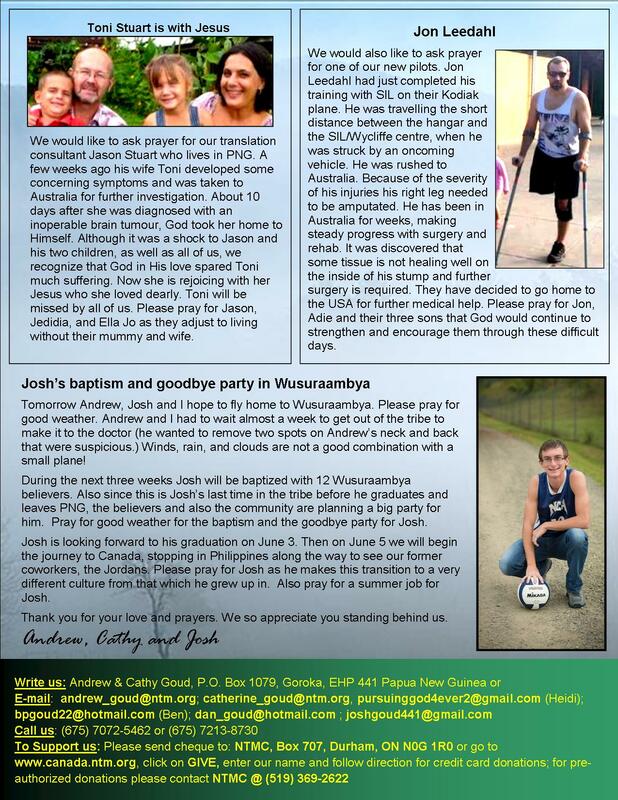 Josh will be flying out for school on the 13th and I should be arriving back in PNG on the 16th. I hope to be able to fly back into the tribe on the 19th if I can find a plane going that way. 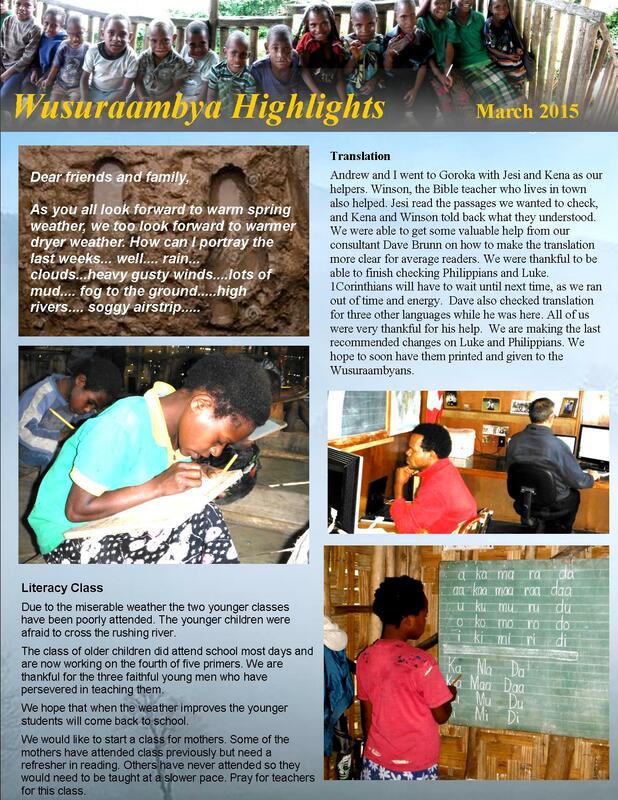 Please be praying for the Wusuraambya church right now, especially for the leaders. They have been through a number of difficult trials lately. 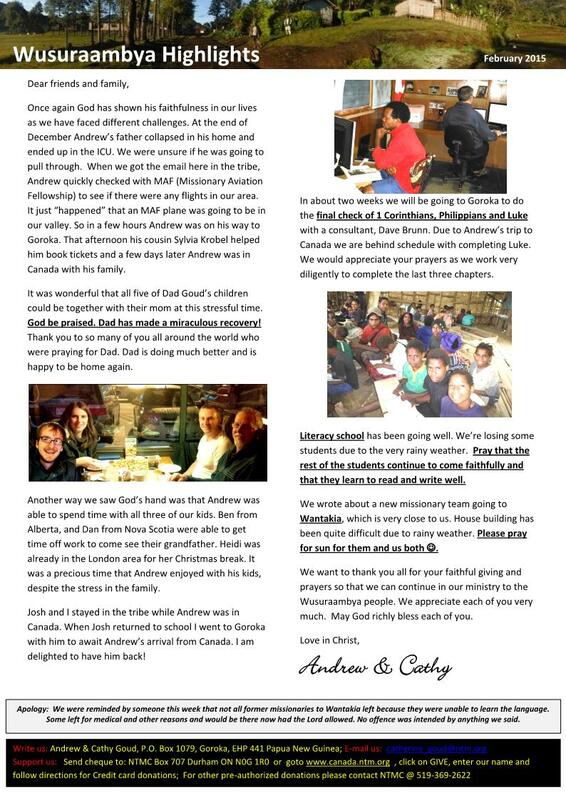 They had been planning an outreach to a village on the south border of our language area when one of the primary Bible teachers suddenly left for town. Josek was being ridiculed because he wasn’t working to help his clan members with school fees, etc.. So he has gone to find work in town to help with those costs. Willis was in shock when he heard that Josek had left so suddenly, as were we. He’s not sure he can do this outreach alone along with his other responsibilities. Its hard to face trials like these, yet the apostle James tells us, “whenever trouble comes your way, let it be an opportunity for joy. For when your faith is tested, your endurance has a chance to grow. So let it grow, for when your endurance is fully developed, you will be strong in character and ready for anything.” (NLT James 1:2-4) We know this to be true from personal experience, yet its never easy in the midst of these trials.